River deltas face threats other than rising sea levels. 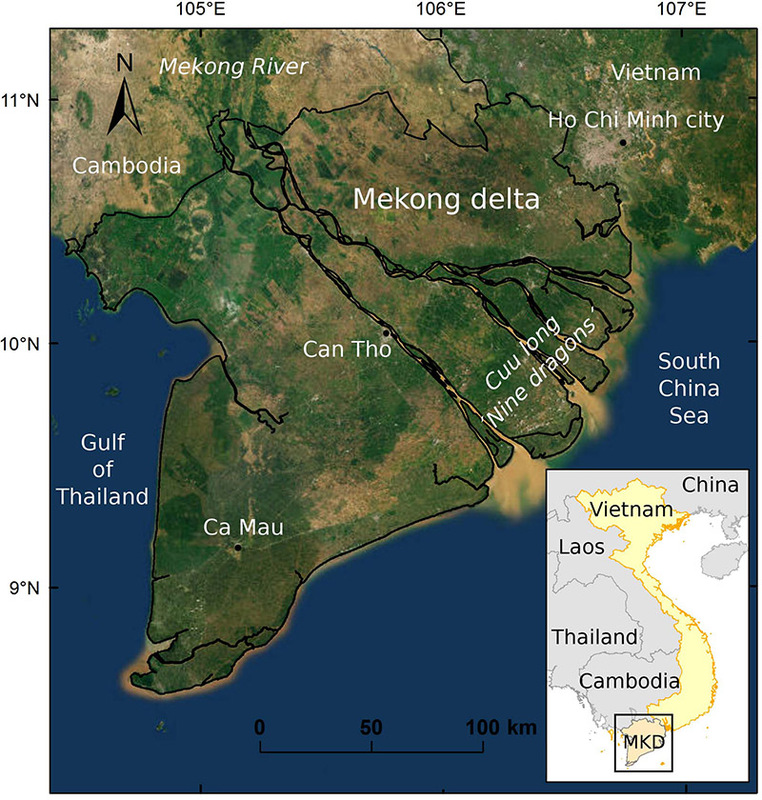 Physical geographer Philip Minderhoud (Utrecht University and Deltares Research Institute) has studied soil subsidence in the Mekong delta, and managed to raise the issue with the Vietnamese government. Minderhoud will defend his dissertation in University Hall at Utrecht University on 15 February. Satellite image of the Mekong delta in Vietnam in South-East Asia. Source satellite imagery: ESRI, DigitalGlobe, GeoEye, Earthstar Geographics, CNES/Airbus DS, USDA, USGS, AeroGRID, IGN, and the GIS User Community. The Mekong river delta is the third largest delta in the world, and around 18 million people call the delta home. Vietnam is also the world’s second-largest rice exporter, and the majority of that rice comes from the Mekong delta. In his dissertation, Minderhoud shows how continuing with the current practices would have major humanitarian and economic consequences. He therefore advocates, next to reducing the amount of ground water extraction, a combination of ‘hard’ and ‘soft’ measures to deal with the problem. “The hard measures include building dikes and draining polders around economically and socially important areas, such as cities.” Soft measures include encouraging natural soil deposition by limiting the construction of dikes. “That would encourage the growth of native vegetation, such as mangrove forests, which in turn helps prevent erosion and promotes sediment deposition. Other measures include pumping surface water back underground in order to slow the process of soil subsidence.” The researcher emphasises that surrounding everything with dikes would be economically impossible. His thesis is part of the Urbanizing Deltas of the World: ‘Rise and Fall’ research project, which is funded by the Netherlands Organization for Scientific Research (NWO), Deltares Research Institute, and TNO-Geological Survey of the Netherlands. His research contributes to Utrecht’s Pathways to Sustainability programme ‘Water, Climate & Future Deltas’.